VSLD (Virginia Society of Landscape Designers) winning project- Design and Members Choice. Williamsburg, Virginia is stepped in history and tradition. It is also home to classic style and elegant design. It is the setting for America’s oldest institute of higher learning, The College of William and Mary, and Colonial Williamsburg is one of America’s finest examples of our restored yesteryear. It’s no surprise that my Williamsburg client’s priority is extending the grace and charm of their surrounding environment and home to their outdoor living retreat. 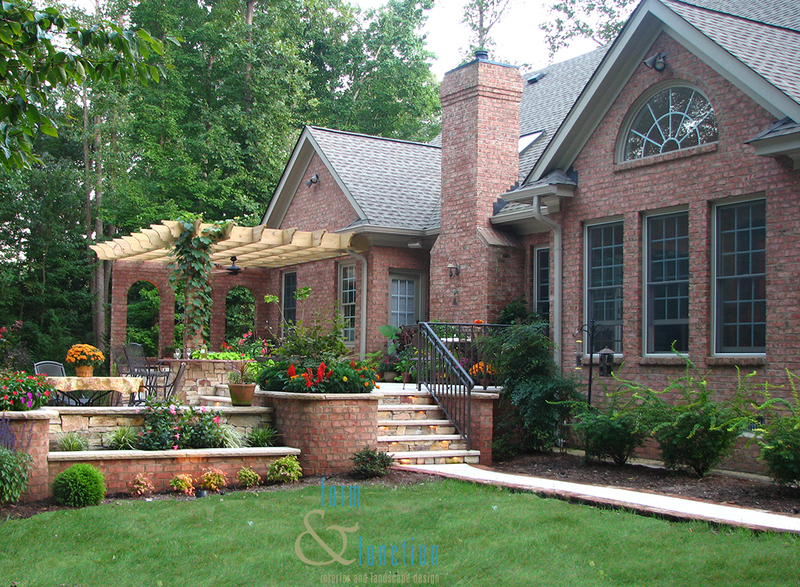 Initiating the design process was the client’s goal of incorporating a new stone patio on two levels while maintaining connection to the surrounding woodland. In order to provide unobstructed views, one of the aesthetic goals was to craft a very low profile solution requiring minimal railings or other visual obstructions. The solution: configuring the benches along the perimeter in such a way as to create a natural safety barrier. 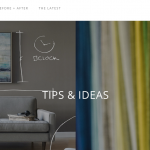 The resulting design artfully meets those objectives. Surrounding most of the patio on the outside of the benches are stepped brick planters. The back of the planters forms the face of the bench above, integrating the three dimensional components. The outcome creates clean lines and an almost sculptural effect. Rounded, taller brick planters are positioned at the outside corners of the layout and accommodate small trees, anchoring the overall arrangement. The resulting design also highlight a fire pit, outdoor kitchen, brick arches, pergola, and a water feature, all part of the initial project criteria. While meeting all of the project criteria, the design solution incorporates creative and unusual elements. 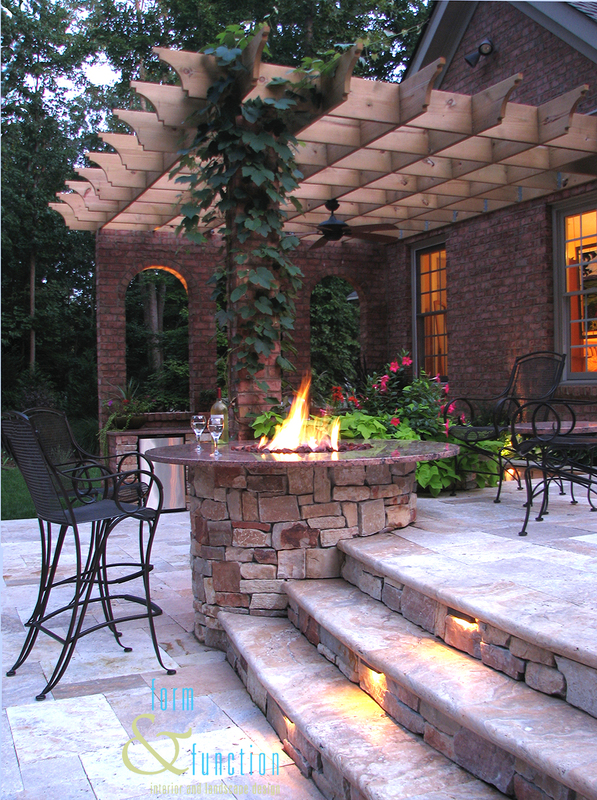 A noteworthy focal point is the round fire pit located in the center and at the intersection of the two floor levels. It is positioned so that when seated on the lower level, the round granite surface surrounding fire pit is at bar height. Conversely, when seated on the upper level, the opposite side of the continuous fire pit surround is at coffee table height, and a convenient height to prop ones’ feet up for warming by the fire. The backdrop for the outdoor kitchen is a series of three brick arches, mimicking details of the existing windows and architecture. 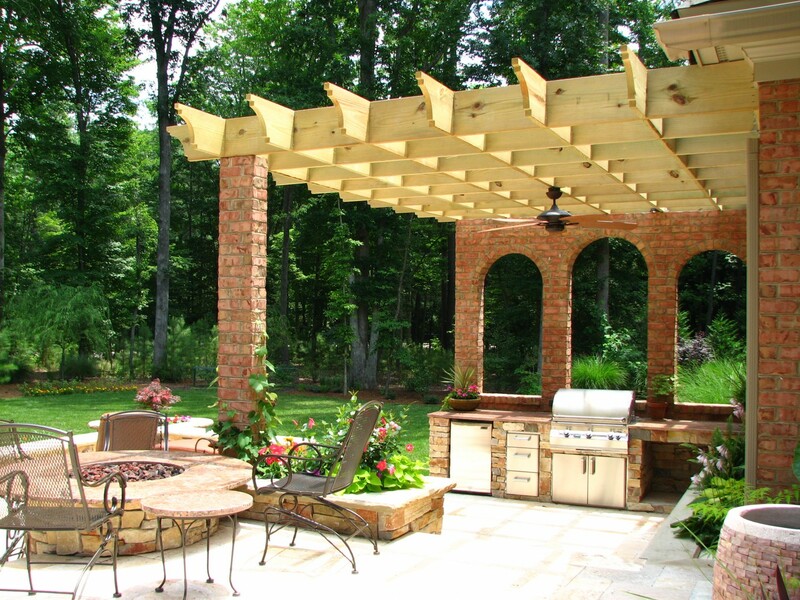 Attached to these arches and connected to brick columns aligning with the fire pit is a wood pergola arranged in a grid layout. Although historic in its inspiration, this unusual pergola motif introduces a sense of the unexpected, adding interest and an element of surprise. Stone and brick are the primary building materials, recalling some of the local and familiar material palette so very much a part of Williamsburg style. The floor is a beautiful multi-size travertine, and matching, solid, radius cut stair treads transition the two patio levels. Sandstone slab benches with beautiful veining add rich character. The irregular cut stone vertical surface of the fire pit and the back of the planters introduces another visual surprise, and complements the other materials stunningly. The contractor searched to locate brick and mortar exactly matching the existing home, creating a seamless, integrated visual. Although rectangular in plan, the layout incorporates steps between the levels and to the entry walkways that are shaped in wide, sweeping arcs, once again lending a feeling of grace and style to the overall ambience. The homeowners are accomplished gardeners. From day one, the installation and plantings has a sense of maturity and substance, and an almost tropical effect. 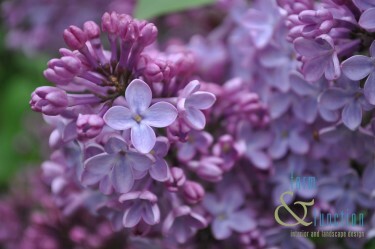 Each year will bring more beauty and enjoyment. 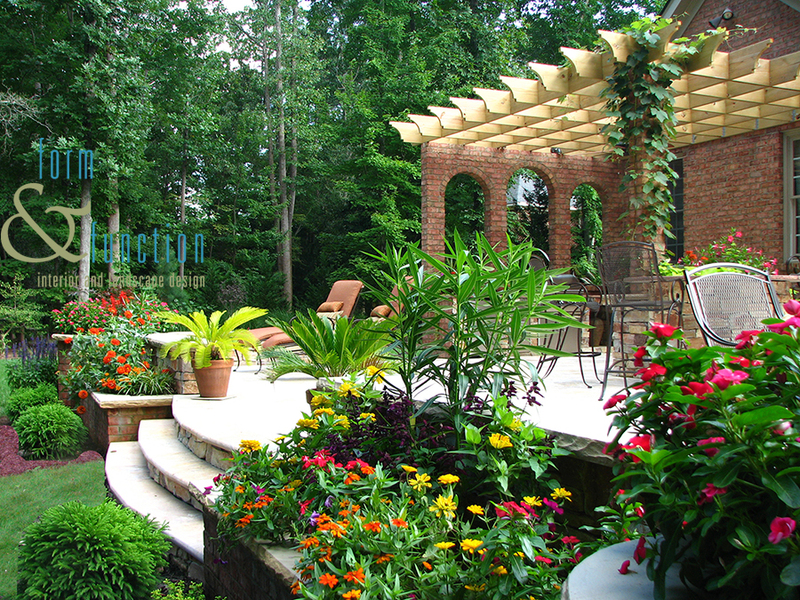 Beautiful design and functional for any yard! My own ode to spring!